Hello. Just sharing a card I have published in the new Paper Crafts special issue: Holiday Cards and More. I used felt and THIS Spellbinders flower die to create a Poinsettia. It's fun to use non Christmas products in different ways. And it makes your supplies go further. Have a good day, I'll be back tomorrow. Love the simplicity of this Christmas cards. I'v also used felt to die cut poinsettias recently and I just love the added texture that it gives. 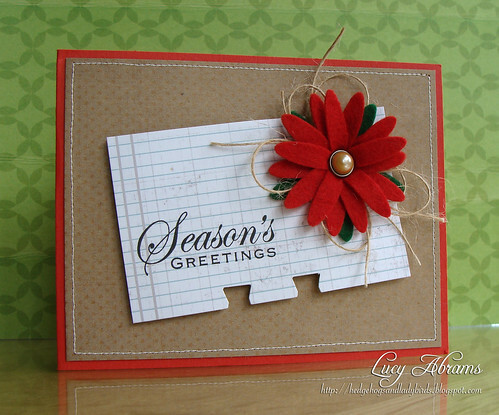 The red looks gorgeous with the kraft, Lucy, and I love your felt poinsettia! Very pretty and creative idea. One that I wouldn't have thought of. fabulous Lucy. That Spellbinder was one of the first I got and I don't use it nearly enough. Thanks for reminding me about it!